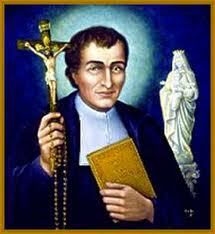 There are 33 days of preparation to do the Total Consecration to Jesus through Mary, as laid out by St. Louis de Montfort. The following excerpts are meant to give us some thoughts to ponder the meaning of this consecration. At the end are instructions on how to prepare for it. In the town of Pontchateau, St. Louis inspired the peasants to build a huge monument to the Passion of Christ on a neighboring hill. For 15 months hundreds of peasants volunteered their skills and labor to build it. When completed, it stood as a massive structure, a real labor of love, and on the day before it was supposed to be dedicated by the bishop, word got back to Louis that his enemies had convinced the government to destroy it. (They had lied to the authorities, saying that the structure was actually meant to be a fortress against the government.) When Louis received this disappointing news, he told the thousands of people who had gathered for the blessing ceremony, "We had hoped to build a Calvary here. Let us build it in our hearts. Blessed be God." To be one in will with Mary of the great fiat, the only human being whose will has never deviated by her choice from God's, is to be perfectly united to the will of God. And it is this alignment of your will with His that is the pressing business of your life." Several months after Mother Teresa first felt her "call within a call," she experienced three visions that further expressed her calling. In the first vision, she saw a huge crowd of all kinds of people that included the very poor and children. The people in the crowd had their hands raised towards her and were calling out, "Come, come, save us--bring us to Jesus." In the second vision, the same great crowd was there, and this time Mother Teresa could see the immense sorrow and suffering in their faces. She was kneeling near Our Lady, who was facing the crowd. 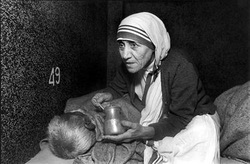 Although she couldn't see Mary's face, she could hear what she said, "Take care of them--they are mine. --Bring them to Jesus--carry Jesus to them.--Fear not." "I have asked you. They have asked you, and she, My Mother, has asked you. Will you refuse to do this for Me--to take care of them, to bring them to Me?" Without Our Lady, we would be...alone before the crosses of life, oblivious to Jesus in our midst. In times of trial, we are often like the poor in Mother Teresa's vision, covered in darkness, unaware that Jesus is there in the midst of us. Without the fidelity Our Lady gave to Mother Teresa, the world would not have heard those words ("I thirst"), or seen them lived out, today. 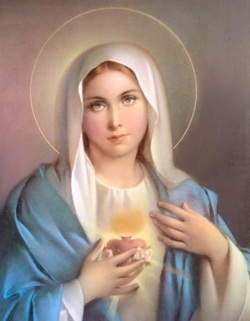 Little Handmaids of Our Sorrowful Mother take care of Jesus' suffering brothers and sisters--bring them to Him--through compassionate intercession, especially through the praying of the Rosary of the Seven Sorrows of Mary. Pray with us at our 7 Sorrows Rosary page!